Physical Review D accepted our paper on "The Inverse Problem for Hawking Radiation". Classical and Quantum Gravity provisionally accepted our paper "On the Inverse Spectrum Problem of Neutron Stars". Selected to participate in the "69th Lindau Nobel Laureate Meeting" in Lindau, Germany. 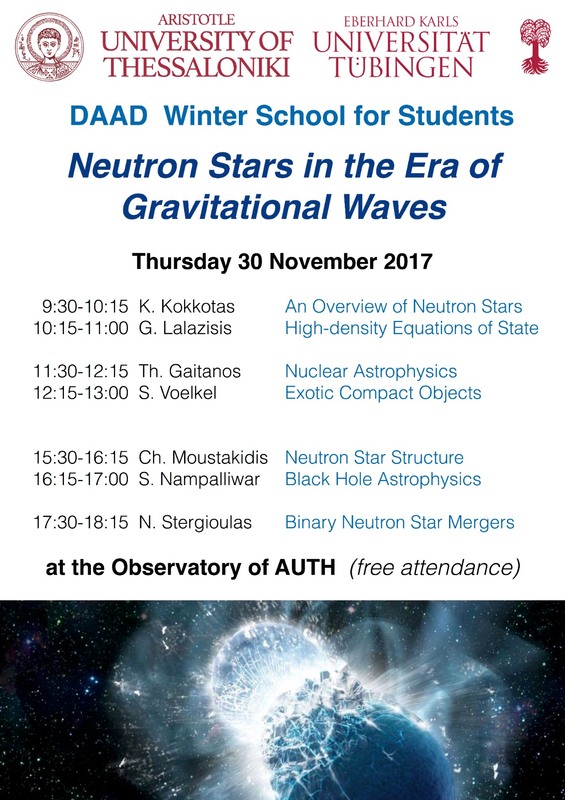 Gave a talk at Gravitational Waves, Black Holes and Fundamental Physics in Athens, Greece. Gave a talk at the 3rd HEL.A.S. SUMMER SCHOOL AND DAAD SCHOOL in Thessaloniki, Greece. Gave a talk at the Kepler Center PhD Workshop in Obermarchtal, Germany. Gave a talk at NEB2018 in Rhodes, Greece. Gave a talk at Domoschool 2018 in Domodossola, Italy. CQG+ published an invited blog article about our recent paper. Classical and Quantum Gravity published our paper on "Wormhole Potentials and Throats from Quasi-Normal Modes". Presented my work at the Science Slam of the Doctoral Candidates’ Convention in Tübingen, Germany. Journal of Physics Communications published my paper on "Inverse Spectrum Problem for Quasi-Stationary States". My proposal for the PhD scholarship Landesgraduiertenförderung was successfull. 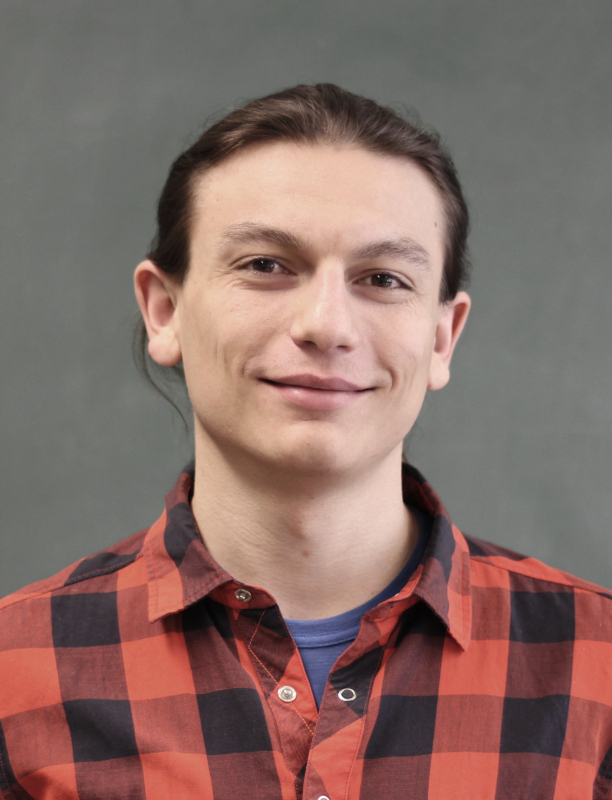 I am a PhD student in the Theoretical Astrophysics group of Prof. Kostas Kokkotas within the University of Tübingen in Germany. Here we are working on our understanding of Albert Einstein's legacy and its fascinating implications it has in astrophysics and beyond. Since the recent groundbreaking detections of gravitational waves from binary black hole and neutron star mergers, we are entering a new era of physics and hopefully find new unexpected aspects of nature that wait to be explored. Outstanding problems like the mysterious dark energy that seems to fill the cosmos or a unified description of gravity and quantum mechanics could be addressed in a new way. The Sound of Exotic Astrophysical "Instruments"
The main focus of my research is on the spectrum of gravitational perturbations of compact relativistic objects. Different compact objects have different spectra and similar to atom spectroscopy or seismic studies of Earth, one can potentially learn a lot about the objects from the knowledge and correct interpretation of their spectrum. Exotic ultra compact objects being more compact than neutron stars but horizonless have triggered much attention recently. Such objects, if they exist in nature, would change our understanding of what we think to know about gravity at its strongest fields. Calculating their characteristic quasi-normal mode spectrum is one interesting way to study them. In this paper we apply a generalized Bohr-Sommerfeld rule to the wave equation of axial perturbations from spherically symmetric and non-rotating ultra compact objects. We compare different applications of the Bohr-Sommerfeld rule with full numerical data and find good agreements. The mathematical form of the Bohr-Sommerfeld rule is potentially useful for similar problems, because it allows for a simpler, but approximate, calculation of the so-called trapped quasi-normal modes. Link to the paper on the arxiv and the journal. Figure 1: The effective potential for axial perturbations of different constant density stars, taken from Völkel and Kokkotas, Classical and Quantum Gravity 34, 125006, 2017. Can one hear the shape of a drum? This famous mathematical physics question is closer to black holes and compact stars as one might expects. It is a beautiful example of how general concepts in physics often are. The answer might surprises. In the case of the drum it is known that a unique reconstruction of the shape is in general not possible. 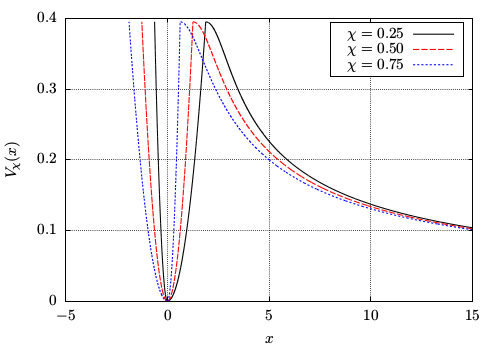 In the case of axial perturbations from spherically symmetric and non-rotating ultra compact objects, we generalize inverse methods for potential wells and barriers to reconstruct significant parts of the effective potential that appears in the perturbation equation. Making use of Birkhoff's theorem we are able to obtain unique, but approximate results for the reconstructed potential by using numerical data for the trapped quasi-normal mode spectrum as input. For a more general summary and introduction to this problem, one can find our invited blog article here. 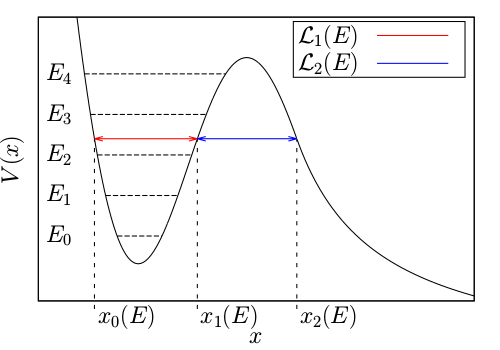 Figure 2: Typical potential containing quasi-stationary states. For a given spectrum the red and blue widths can be reconstructed, taken from Völkel and Kokkotas, Classical and Quantum Gravity 34, 175015, 2017. 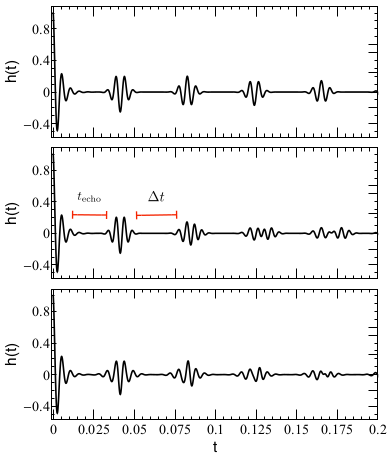 In this work carried out in collaboration with Andrea Maselli, we are interested in the parameter estimation of so-called gravitational wave echoes from exotic compact objects. Although these type of problem has been addressed the first time almost two decades ago, as a more academic question, it has triggered a lot of attention recently. Claims that a signal of this type had been measured by LIGO in the first binary black hole merger event, resulted in an increasing interest in exotic compact objects. In this work we developed several phenomenological templates that should be able to describe the most important features of such echoes and tested if current and future gravitational wave detectors will be able to detect them. Although our approach can only be seen as a first step in a much more involved problem, we find that there is hope that in principle many of the parameters could be constrained with satisfying accuracy. Nevertheless, more work has to be done and it remains an interesting questions. Figure 3: A sample of gravitaional wave echo templates that are characteristic for many exotic compact objects, taken from Maselli, Völkel and Kokkotas, Physical Review D 96, 064045, 2017. This paper gives a comprehensive and general presentation of the inverse spectrum method, which we developed and applied in  to the oscillations of ultra compact stars and gravastars. After demonstrating how the method is derived, we present it to analytic examples for the complex valued spectra of quasi-stationary states and investigate the corresponding WKB spectrum equivalent potentials by parameterizing them. Figure 4 shows a few of the parametrized subclasses for the reconstructed potentials for a given spectrum. We examine what type of potentials can be reconstructed from the spectrum and find some special cases. For example, although there are in principle infinitely many WKB spectrum equivalent potentials possible for a given spectrum, one of our studied spectra drastically reduces this non-uniqueness. Since the inverse method being presented is applicable to one-dimensional wave equations for a wide range of potentials that admits quasi-stationary states, we think it can in principle be of interest for a wide range of applications. Figure 4: Three reconstructed potentials for the same spectrum and different values of our parameterization, taken from Völkel, Journal of Physics Communications 2, 025029, 2018, DOI: 10.1088/2399-6528/aaaee2. In this work we extend the inverse spectrum method, known from ultra compact stars , to the case of some symmetric wormhole models. Such models include the Damour-Solodukhin wormhole, whose perturbation potential is characterized by a symmetric double barrier potential. 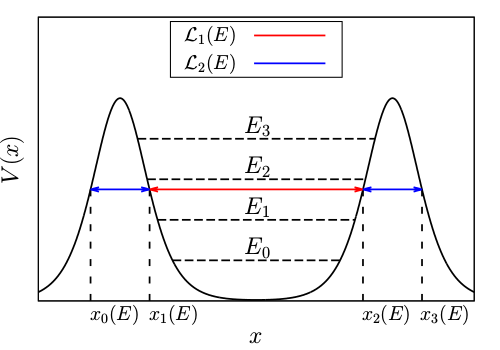 By using the so-called trapped quasi-normal mode spectrum, the inverse spectrum method allows to reconstruct approximatively the underlying potential. 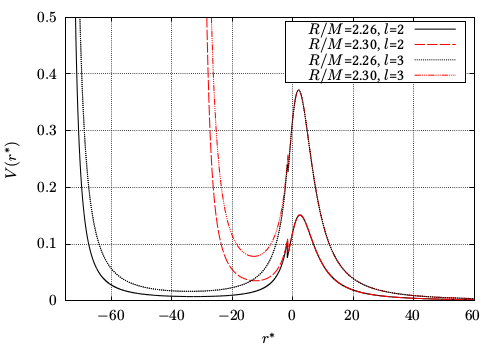 With the potential as intermediate result, it is further possible to recover the parameter of the model that describes the position of the wormhole throat. We also compared our results to the ones obtained for potential wells with only one potential barrier . Within the precision of the underlying method, we find that it can also be possible to reconstruct a potential of this kind, from the same spectrum. Thus it is not always possible to reconstruct only one type of potential, for which non-uniqueness is well known, but also for different types of potentials. In this situation one can not tell if the underlying object is a wormhole or some exotic ultra compact star. The situation can be resolved if more information is included. Ultra compact objects of both types are expected to emit so-called echoes, which describe the time-evolution of reflected perturbations. This can be used to distinguish both types of potentials from each other, because they differ in the exact shape of the potential barrier, which can be related to the first reflection. Figure 5: Shown is an example of the symmetric double barrier potentials studied in our paper. The knowledge of the trapped modes can be used to reconstruct the widths of the potential well and both barriers. Taken from Völkel and Kokkotas, Classical and Quantum Gravity 35, 105018, 2018, DOI: 10.1088/1361-6382/aabce6. © Sebastian Völkel. All rights reserved. Design: HTML5 UP.